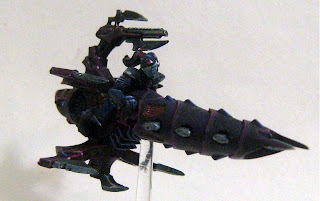 After a long day spent painting and debating the finer aspects of roleplaying on various forums (believe me i'm in favour of making roleplaying and accessible hobby) i have a quick post with a couple pictures of a recently painted reaver jetbike. This is the first plastic model i've posted on this blog. 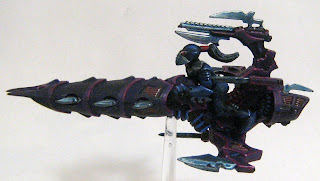 I'm a big fan of these particular miniatures as i find them to be the most ingenious and interesting of the dark eldar models, this model is probably the reason behind the line getting much of it's attention just because it looks so cool. Who wouldn't want a sky faring "ninja" bike adorned with plenty of awesome spikes. I've painted this model in the usual blue and purple paint scheme with blue armour for the rider just to contrast the bike. the bike itself transitions from midnight blue to lych purple, then warlock purple highlights, the same scheme that can be found on the other vehicles in the army, ie raiders. I hope to have a whole unit of these painted up for tomorrow including a bike with converted blaster, which i will detail in the write up as to how it was made.